Life is all about thriving. You could even call it a shared value of all living systems. This value often manifests as an urge or impulse to move toward that which supports life. Plants reach for the sun, roots move toward water, social species move toward community. To me, a business is a living system as well. The urge to thrive manifests itself as a need to make a profit. But just as a plant needs sun and water to thrive, so also a business needs more than just profit. Our core value at SweetRush lies in being what is commonly called a triple bottom line (3BL) business — one that moves toward a mutual good that encompasses economic, social, and ecological considerations. People, planet, and profit. Maximizing thriving, minimizing harm. Good Things! So at its core, this value is what the Good Things Initiative here at SweetRush is all about. But moving from the old profit-only mindset to the more complex 3BL approach has not been easy. Like the Osa Rainforest in Costa Rica, this sort of complex harmony requires evolution, time, and opportunities to thrive. As I mentioned in my last post, “How a Rainforest Changed Our Company,” one of the key lessons learned has been that the people part of the 3BL approach starts with the company’s internal team. As The Body Shop® founder Anita Roddick famously said, “We were searching for employees, but people showed up instead.” Even as CEO, standing on my Good Things soapbox is of little value until I am actually awakening and empowering that same impulse in the minds and hearts of everyone on my team. For our complex ecology to thrive, everyone has to be moving toward the light, so to speak, and I can’t just tell them from the top to do so. I have to inspire them to bring their own innate life-affirming values to work with them every day. And once I got this, it’s been a lot easier! Our people are inherently values-driven individuals — we have always had a strong culture of caring at SweetRush, and we are very intentional about discovering this quality in our HR process. We look for people who care about their craft, the people they work with, and the world around them. This alignment helps our organization in the practice of our values, of course, but also in offering better service. 2013 has been a year of self-expression for SweetRush with a whole new brand, website, blog, and active social media presence. All of these efforts are expressions of our commitment to more actively share our values and to share our services with new audiences. We use our web presence to promote Good Things in the world in many ways, such as with our “thumbs of change” series, our new portraits of world-changers project on Facebook®, and our upcoming sustainability pub quiz (on our website soon, stay tuned…). We’ve also focused our business development toward finding client partners aligned with our values and whose own CSR endeavors we can support with our customized services). These efforts have already differentiated us to client partners seeking a team with shared commitments to sustainability and socially responsible business practices. And we are thrilled to be supporting more and more inspiring 3BL business approaches with our training and design skills. You can get a taste of some of the work we’ve done in this arena in our Good Things Facebook album. Recently, some of our team met to explore how we could bring more of the meaning and purpose of work into our training design. Why? Because meaning improves both work performance and satisfaction! Learning is improved when leaders have an emotional connection to the learning. Intrinsic motivation is much more powerful in improving performance and creating change. Meaning and purpose connect us to more complex and dynamic values than the simple single financial bottom line. 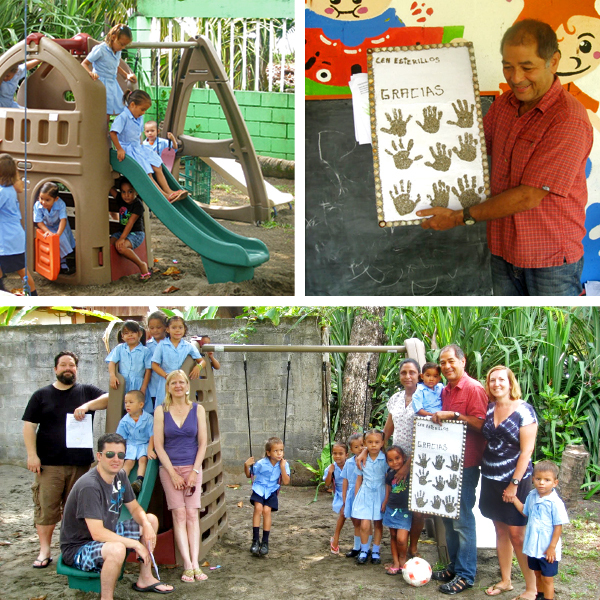 SweetRushians love volunteering — check out this inspiring little project from this past spring in Costa Rica, for example. Getting together like this is rare for our virtual teams, though, so we use a theme-based rolling campaign approach. Our current theme is food justice. This fall, employees will get paid for volunteering for food-related causes of their choice in their local areas with groups of SweetRush employees encouraged to volunteer together where possible. There will also be ongoing education and awareness opportunities for staff throughout the campaign. Stay tuned for more on this on our SweetRush Facebook page! Absolutely central to any effective approach to 3BL business is walking the walk internally and caring for your own employees first. One way we have devised to do this is through the role of a Quality of Life Officer (QLO), who is responsible for advocating a healthy life-work harmony for our team, in line with our values. This year we are revising our approach to have this be a rotating position among our department heads and their deputies. This will help vary the voice and focus of this role, and also create new leadership and learning opportunities for our team. These are a few of the components that make up the ecology of Good Things at SweetRush. The everyday practice of bringing our values to life through our services is of course our most central offering, and I’m pleased to see our team come together to find more and more creative ways to integrate our Good Things values into our core services. Stepping back, I see a healthy, productive, virtual forest beginning to take root at SweetRush. And from my home office in California, suddenly that magical rainforest in Costa Rica that first helped me see the light doesn’t seem so far away. We all know that corporate social responsibility (CSR) has become a hot topic in business..
We don’t need to spend much time persuading you that a clear commitment to sustainability.. I have been in the training industry for more than a decade, and I also.. Some time ago, I took a trip that changed my life and the future of..
SweetRush is happy to share that we have been featured in the Environmental Leader 2013 Insider Knowledge Report as an example of launching a corporate social responsibility (CSR) program in a smaller B2B company.